Share your photos on Instagram with the hashtags #sailboattop and #oliverands. Pull-on button-shoulder top has long sleeves,top stitched details, and curved shirt-tail hem. 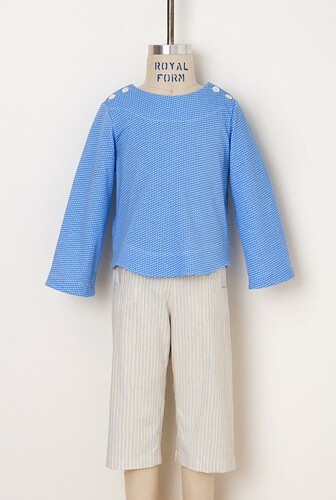 Sailor-style button-front cropped pants include side vents and elastic at the back waist. Matching A-line skirt also includes button front closure and back elastic. After successfully sewing this pattern, you will have developed the following skills: buttonholes, flat-set sleeves, kick pleat, and set-in pockets. Light- to medium-weight woven fabrics like quilting cottons, broadcloth, canvas, corduroy, denim, poplin, and seersucker. 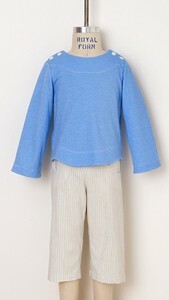 Top can also be made in light- to medium-weight knits like jersey or interlock. Pants + skirt: Thread, four 5/8" buttons, 1/2 yard of 3/4"-wide elastic, light-weight fusible interfacing. Top: Thread, four 3/8"-1/2" buttons, light-weight fusible interfacing. Top, back length* 12 3/8" 13" 13 1/8" 13 5/8" 14"
Chest, all around 22 1/4" 23" 23 3/4" 24" 25"
Sleeve Length 10 3/4" 11" 11 1/4" 12 1/4" 12 3/4"
Skirt Waist, extended 19 1/4" 20 1/4" 20 3/4" 21" 21 3/4"
Skirt Length 7 1/2" 8" 8 1/2" 8 3/4" 9 1/2"
Pant Waist, extended 20 3/4" 21 3/4" 22 1/4" 22 1/2" 23 1/4"
Pant Length ** 13" 14" 15" 15" 16 1/2"
Top, back length* 14 7/8" 15 3/4" 16 5/8" 17 7/8" 18 3/4"
Chest, all around 26" 27" 28" 29" 30"
Sleeve Length 13 1/4" 13 3/4" 14 1/4" 14 7/8" 15 3/8"
Skirt Waist, extended 22 1/2" 23 1/4" 24" 24 3/4" 25 1/2"
Skirt Length 10 1/4" 11" 11 3/4" 12 3/4" 13 1/2"
Pant Waist, extended 24" 24 3/4" 25 1/2" 26 1/4" 27"
Pant Length ** 18" 19 1/2" 21" 23" 24 1/2"
I've made several of the sail boat top in double gauze and chambray fabrics. Such a sweet design, and the pattern is easy to understand and use. I'm looking forward to trying the pants in due course. 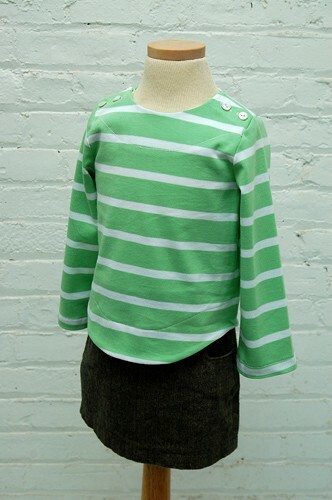 This is one of my favourite shirt patterns but I make it in knit interlock fabric (the Birch knits work well). I've always found the sleeves to be the perfect size- though the trousers were a little on the short side. My first Oliver and S pattern and got me completely addicted! I finally finished making a pair of Sailboat pants and the top for my son. They both come together really well and are fun to sew (as are all Oliver+S patterns). I did find that the top, when made in a woven fabric, is just a big snug, and my son is quite slim. The sleeves are also a tad short, and I'd probably lengthen them next time. I used his chest measurements as a guide, but would probably make a larger size next time, or use a knit fabric as suggested by another reviewer. The pants are really cute with lots of fun details. I love this pattern. I have made 2 of the tops in size 12-18 months for my son. The instructions are great, and pattern pieces are well drafted. My son is slightly shorter than average so if your child is tall there might be a need to add length to the bottom hem. Love this great pattern. It goes together quickly with adorable results. Clear instructions. I'm loving sewing these older patterns. Such a cute pattern with fantastic instruction and pieces that fit together beautifully. I might attempt to grade it up to my size.... Marin love it. I have made the skirt and trousers so far. Come together so quickly and they look great on. I love the design and how you can use contrast fabric. I was asked where they were bought from! Only minor point is that the length was a bit short on my daughter (even though I made a size 5 and she is normally a 4T in rtw) so I will size up on the length next time. I have only sewn the pants (so far!) and I love them. They come together pretty fast and I even added a lining because I was using scratchy wool. I am giving it 4 stars though because I find the rise a little low for my constantly crouching toddler. But they are seriously adorable pants. Love this pattern from O and S. The finishing of the product looks amazingly professional. The instructions are so clear for every step. I did think that the sleeves for the top were slightly short. But, I added a cuff to make them the length I preferred. Great pattern. Directions were very clear and easy to follow. I made the skirt and pants and both turned out very cute. My daughter said they were very comfy! Another amazingly brilliant pattern by Oliver + S! My sister wanted to get back into sewing after many years so I purchased the pattern for her and guided her through it. She was so thrilled with the results that she went home, cleaned out the house and created a sewing corner for herself! And so versatile! I love this pattern so. I can't imagine a cuter outfit on a wee baby boy. Its a modern cut sailor suit! I made many pairs of the trousers for my little girl. I blogged a few short cut tips here. http://fiveandcounting-motherof5.blogspot.com.au/2011/08/short-cut-sailboat-pants.html For my middle daughter I made a dressy pair of the trousers and the skirt in a polished cotton satin. It completely changed the look. My older girls had several skirts made in stretch drill. http://www.flickr.com/photos/motherof5/8391724162/in/set-72157625138776927 they loved them and they were sadly missed once handed on. The trousers were equally lovely lengthen and worn in winter. http://www.flickr.com/photos/motherof5/5640026993/in/set-72157625138776927 Definitely not just a girly pattern. It was one of my favourite looks on my son http://www.flickr.com/photos/motherof5/5444046339/in/set-72157625138776927 . The top makes up nicely in a knit too. I did find my Biggies needed a little extra arm length. Don't be concerned about purchasing a PDF pattern. Oliver+S do them so well! I love this pattern because it can be great for boys (maybe on the younger side I guess) and girls. You get so many more options to use this pattern that way. I find the top fits best in knit. I also found it doesn't hurt to lengthen the top and skirt a tad. 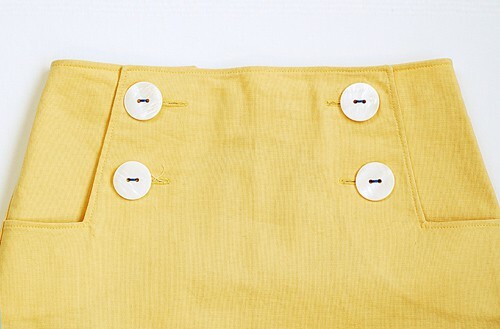 The notches on the pant leg and the kick pleat in the skirt are a such cute details. You can also have a lot of fun adding piping to the top front. This was the O+S pattern that hooked me. I love the button details on both the pants and the skirt and I couldn't wait to sew them for my girls. As I've now sewn more than a dozen, it's safe to say that it hooked me. I have sewn all three items, including a tank top version of the top. 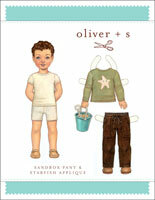 It's an adorable - and dead simple to sew - pattern but I did find the rise of the pants to be a little low for those still in diapers. Once my older girl was wearing underwear they fit great, though. The first printing of the pattern contained an error in the cutting layout diagram. The cutting layout for the Sailboat Pants piece 7 should be cut on the fold as shown here (not on the selvedge as shown on the original cutting layout).This error was corrected in the second printing and in the digital pattern. The first printing of the pattern contained a small error on pattern piece #10. It mis-identified the 18-24M buttonhole as 6-12M. This error was corrected in the second printing and in the digital pattern. Note the correct labels for the upper buttonhole as shown below. The printed version of the pattern contained a minor error in the instructions for sewing the pants inseam. The first sence of step 1 should begin, "With right sides together...."
Discussion on the digital sailboat top, skirt + pants sewing pattern from the Oliver + S Discussion Forums. Find and share more photos on Instagram using the hashtags #sailboattop and #oliverands.